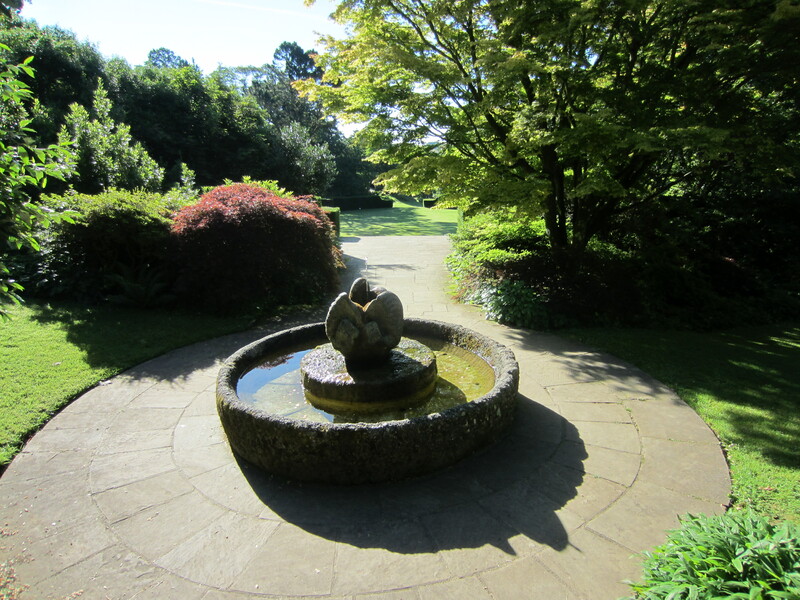 So after an even longer than usual hiatus, I thought I should finally get this out in the blogosphere, to remind myself of some more of the great music I was introduced to at Dartington. And to reassure everyone that I still exist. After lunch each day was the Vocal Ensemble course, taught by Sally Dunkley and members of the Tudor Ensemble, all of whom sing regularly in the top choirs in the UK. (Yes, I’ll admit that for me it was a little bit like mixing with “choral royalty”, since Australia doesn’t have anything like the same scale or number of excellent choirs as England. I hope I didn’t swoon too much.) Anyway, this course presented a great opportunity to break into smaller groups and sing early music, both sacred and secular. The groups changed each day so we were able to sing with different people and look at different repertoire. I think the best session was the day we had a group of six of us, just one per part (my favourite kind of ensemble singing), and we worked on a madrigal by Thomas Weelkes that I’d never come across before. While plenty of madrigals are full of talk of nymphs and double-entendre’d fa-la-la-ing, I quite liked this one for its historical and geographical significance and its slightly unusual text. Trinacrian Etna’s flames ascend not higher. Whose heart with fear doth freeze, with love doth fry. Amidst an ocean full of flying fishes. Indeed. A little melodramatic, but so much fun to sing! In the evenings we were spoilt for choice of performances to go to, most of them given by the musicians who were teaching various courses. There were generally three concerts a night (with a couple of film screenings thrown in as well), and the most amazing variety of talent on display. I went to as many as I could reasonably handle – given that the days were long and intense as it was, and sometimes all we wanted to do after dinner was head to the pub. But I think I still counted twelve that I went to. Plus the pub. I won’t regale you with details of all them, but a couple were particularly memorable. There was a really interesting music and puppetry collaboration by the early music ensemble The Dufay Collective, in which a beautifully-made bird puppet was launched along a wire from the side of the stage to the balcony at the back; accompanied by their early instruments, it was quite a poignant moment. And one of the late-night concerts included a stunning sonata for solo viola da gamba. I have a soft spot for the cello (and you might recall a brief excerpt from The Cello Suites earlier this year) and the viola da gamba is a close relative, but with extra strings. It wasn’t my main motivation for going to the performance, but it was my personal highlight. 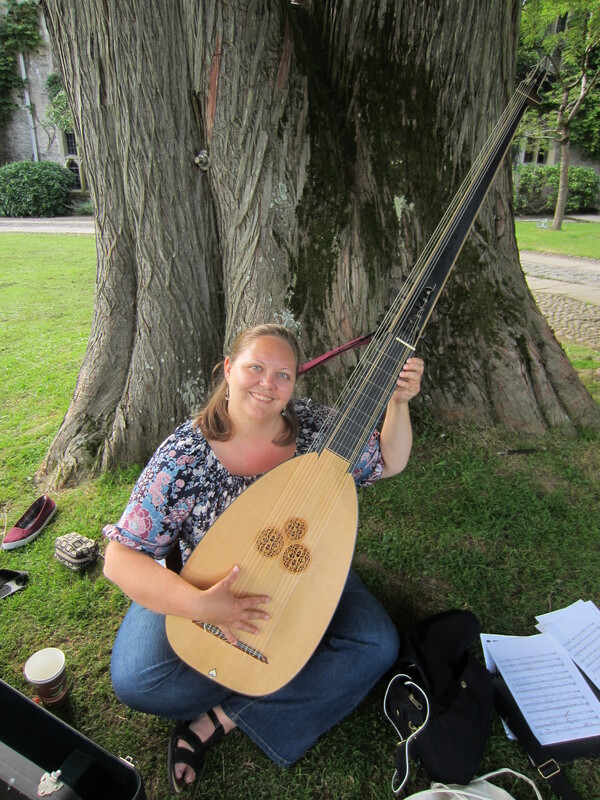 There were a number of ensemble pieces first before Reiko Ichise (from Fretwork) took the stage – when she started playing, wow did I sit up and take notice. I’ve rarely seen anyone have such a commanding presence on stage and look as though they were in such perfect union with their instrument. The physicality of her playing was just extraordinary. She played like her life depended on it; I could barely take my eyes off her. I can’t find a recording of the piece from the concert but it was the Suite in A Minor by Monsieur de Sainte Columbe le fils (as in, the son of), a French composer from around Bach’s time. Here’s the D minor suite instead which gives you the general idea. Such a sorrowful but achingly beautiful sound. Of all the many things to love about attending the summer school, one of the things I enjoyed most was how much it’s like entering a parallel universe for a week. The world still looks kind of the same, and you’re still the same person, but there’s one crucial difference: you’re not considered strange for having a passion bordering on obsession with early music, or choral music, or with whatever unusual instrument you’ve chosen to specialise in. For an entire week you get to mix with people who completely and utterly get what it means to get shivers down your spine at a glorious suspension in Tomkins’ When David Heard, who compare different score editions the way ‘ordinary folk’ talk about celebrity gossip, or people who make reference in casual conversation to ‘four-forty’ or ‘four-fifteen’ and you know they’re not talking about what time it is. In other words, it’s completely OK to be a music nerd on a grand scale without attracting awkward looks in public. 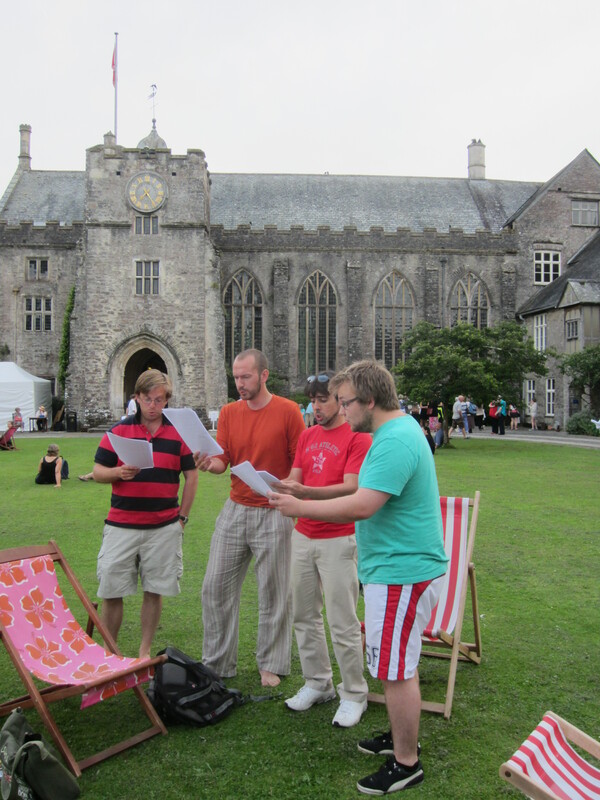 And another day, in the free time between dinner and the evening concert, a quartet of guys got together in the striped deck-chairs to sing through a barbershop arrangement of Tonight from West Side Story – which just goes to show how diverse a bunch of musicians you will find at Dartington! Watching them was pure fun – if only I’d been able to get them on video, although I managed to get some photos. Here’s another group singing the same arrangement. Well I think that all the music I’ve shared in these two posts pretty much sums up what a wonderful week I had at the summer school in July. I already miss friends that I made, but I relive the experience by listening to some of the tracks above (and those in Part 1). 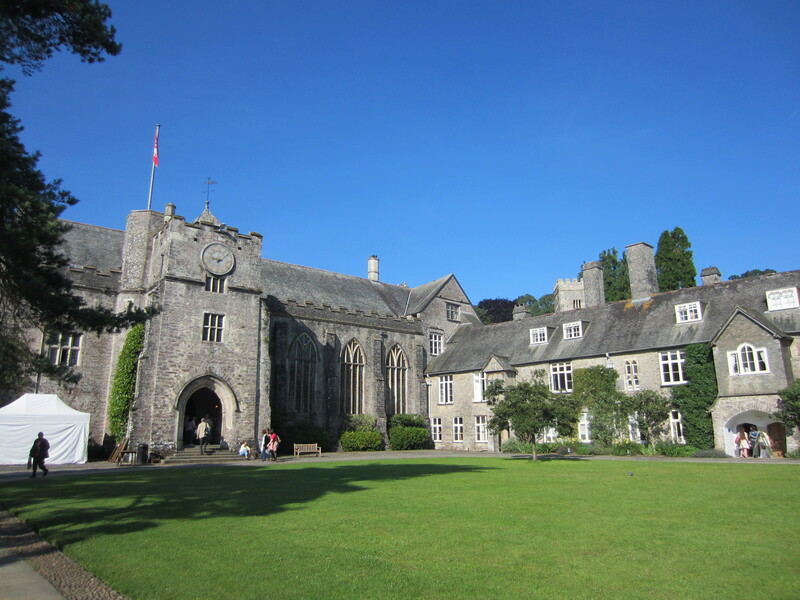 If you’re an aspiring musician of any sort, professional or amateur, I highly recommend checking out what Dartington might be able to offer you! 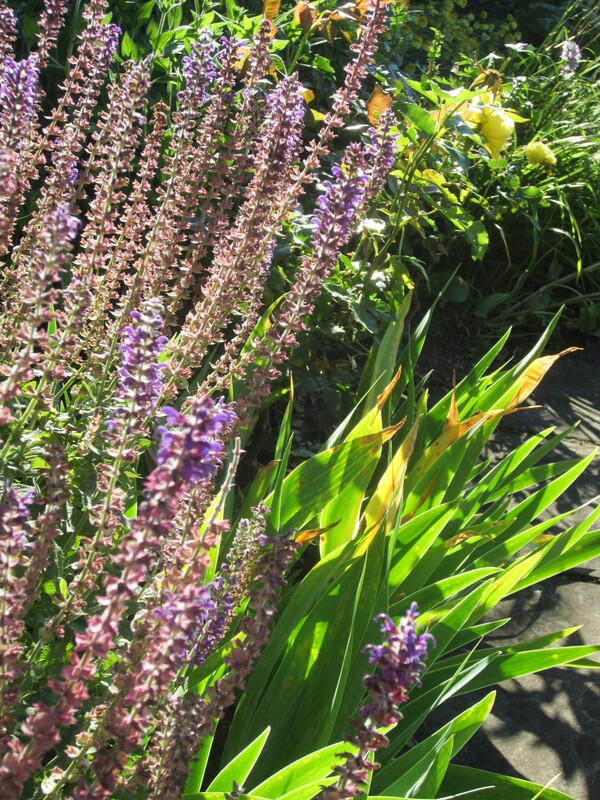 This entry was posted in Choirs & Choral Music, Folk & Popular Music, Orchestras & Instrumental Music, Solo Vocal Music, Travel and tagged Dartington, madrigals, Philippe Jaroussky, viola da gamba. Bookmark the permalink.